Presented by Lewis and Clark Art Week, Lewis and Clark College, Portland, OR. Like most colleges around the country, Lewis & Clark monetizes their campus facilities to help financially support and sustain the college and its programming. This process is a delicate balance between the institution’s need for revenue and its mission statement of creating “a community of scholars.” Lewis & Clark welcomes inquiries from outside groups interested in renting the campus and its facilities for public or private events, especially during the summer when the College is not in session. 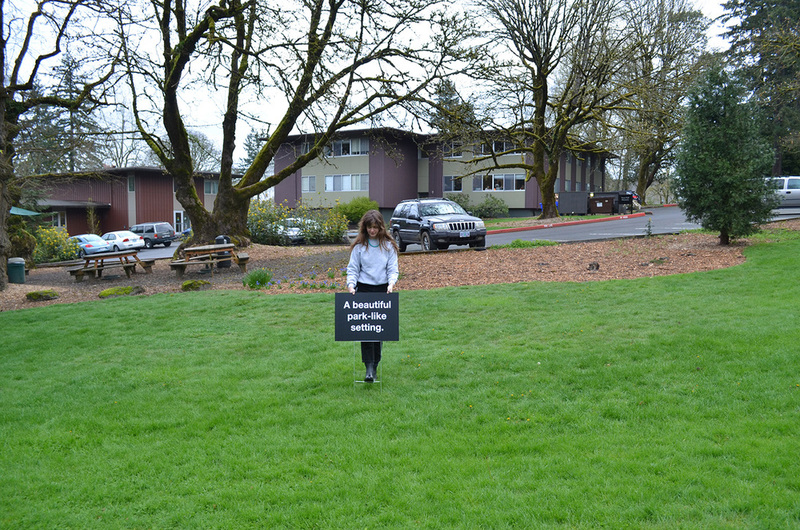 For the right price, you can hold your event almost anywhere on Lewis & Clark’s campus — Byrne-Seres and Crews created a series of fifteen signs and a contextualizing map that utilize the copy from the college’s event website to point at this common problem. The signs mimicked the college’s graphic identity, were paid for by the college, and installed throughout the campus as part of LC Art Week. A few hours after being installed, the signs were removed by campus safety officers when they got several calls from administration that cited the signs as a confusing and dangerous threat to campus safety. They have since been acquired by the campus sign storage center, and the vinyl letters were removed so the signs could be recycled by the university.